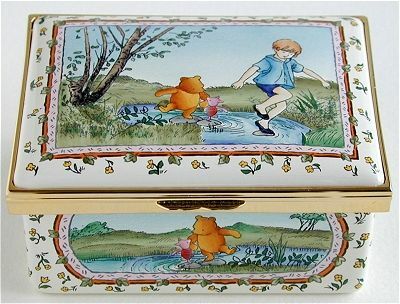 Halcyon Days Enamels Winnie the Pooh enamelled boxes. We have a nice selection of the Pooh boxes that were issued in limited editions. Christopher Robin Pooh and Piglet have found the 'Perfect Spot'. For the lovers of Winnie the Pooh this box is a must. Not since the 100 Aker Wood box has there been a box so appealing nor so large. There are four different images around the sides of the box. Click on the larger photo to see one. If you would like me to email you the others please let me know as I have large pictures of all sides.